Amy offers private yoga sessions for all levels. Whether you want to deepen your current practice, modify your practice due to pregnancy or injury, or simply want to learn proper alignment for key poses before you join a packed class, you’ll work together to tailor a program that fits your needs, goals and schedule. Sessions are 60-90 minutes and take place at Amy’s home studio, Yoga Heights, or your home/office/gym. Private and semi-private class locations will be determined by the student at the time the session is scheduled. Yoga practices are a powerful complement to professional treatment for anxiety, depression, trauma, and Post Traumatic Stress, also known as PTS and often referred to as PTSD. 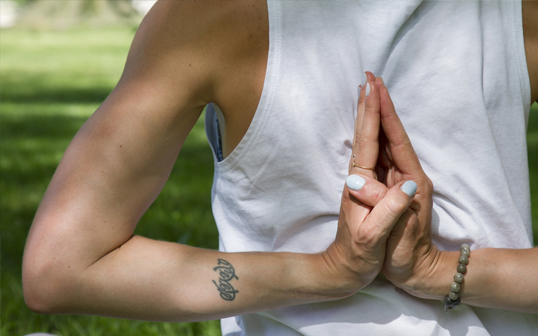 A mindful, embodied yoga practice can provide relief from symptoms and develop the supportive skills that those effected need in their everyday lives. Yoga has proven to help those suffering along on their healing journey. Amy’s adapted 12-week Mindful Yoga Therapy program might be just what you need to get out from under your mental and emotional demons. Contact Amy for more details. No matter what your fitness level, Amy’s Barefoot Bootcamps are designed to help you look and feel your best. Your body will become more toned, your joints will hurt less and, most importantly, your confidence will rise. Join this amazing community! And remember, strong is beautiful. And, fun music to help your early morning sweat session fly by! Sign up for her next bootcamp here. Please contact Amy for pricing. Packages can be created to suit the individual needs of each client.